Childage: 4 mos. -11 years old. Bike the Bay Your Way! Enjoy the freedom & adventure to go wherever YOU want. 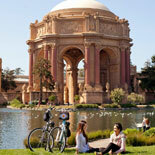 Relax and see the city up close while exploring it's many "back road" gems on your self guided back ride. Self guided means "you decide the ride"
Bay City Bike Rentals' customers and staff know that the best way to see San Francisco and bike the Golden Gate Bridge is with Bay City Bike, San Francisco's favorite bike rental. 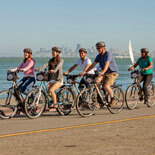 Beginning from either of Bay City Bike's rental locations on Fisherman's Wharf, guests are outfitted with a current year model bike, helmet, front handlebar bag & rear gear rack, map and route instructions. A beginner's leisure ride! 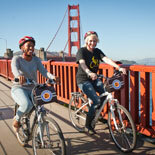 Bike through Fisherman's Wharf, Municipal Pier, Fort Mason, Crissy Field, the Presidio, and Fort Point. Bike the Golden Gate Bridge on a wide bike path with awesome views! Coast two miles downhill into sunny Sausalito, a sleepy coastal town known for it's dining, art galleries and beautiful views of San Francisco Bay. GO FOR IT! Continue to Tiburon, riding the path that stretches through the Bothin Marsh in Mill Valley. Ride over to Blackie's Pasture Park, where the pure waterfront bike path stretches into seaside Tiburon. At all times, your safety comes first. Bay City Bike is committed to providing the right bike, map and equipment for each rider to ensure that their ride is safe, exciting and hassle-free. With so many sites to see and things to do, what are you waiting for? 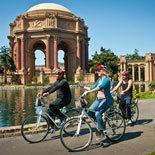 Get your eTicket today, rent your ride and Bike the Bay with Bay City Bike and enjoy "a bike ride unmatched!" Rentals are available 365 days a year. Open from 8:00 am to 7:00 pm. 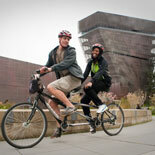 Bike rentals may be kept for up to 24 hours. Child Ticket: under 11 years old. Reservations are not required but are suggested + Bay City Bike rentals are weather-sensitive. Under weather conditions that are deemed non-operable, they reserve the right to cancel any scheduled bike rental within 24 hours of the actual ride and will notify you at that time. Full rain cancels unless client wishes to conduct ride regardless of weather + Adult Riders must be in good health and able to ride a bicycle.